I got to know Shaun while serving National Service and everyone in the camp knew him as being the ‘fit’ and ‘buff’ guy among the group. Like him, I too had battled weight problems for most of my life, weighing in at a startling 110 kilos when I was at my ‘peak’. I took my stint at NS as an opportunity for me to shed some weight and started exercising religiously 3 times a week, going to the gym instead of the canteen during lunch breaks. I did lose some weight doing this, however after a few months, my weight loss stagnated and any exercise I did mysteriously did not have any effect. That’s when Shaun came into the picture. Knowing of my desire to lose weight and be fit, he invited me to join him in his training regime. I was apprehensive at first, as it seemed like a daunting task to train with someone who was miles ahead of you in terms of fitness level. On the contrary, the first few sessions with him, though demanding, were actually manageable. 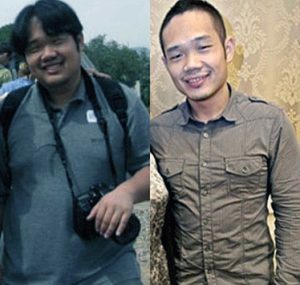 This spurred me on to continue training with him, and half a year later I’ve lost 28 kilos and in the best physical shape I’ve been in my entire life. Better yet, through the whole process I’ve made a great friend and to this day we support each other in our physical training. The thing is, Shaun knows exactly how it feels like to just start off training to reach a certain goal in fitness and physique. He’s been through that road himself. He knows what your limitations are, but more importantly he shows what you are capable of and designs his programs to suit individual needs. He has a lot of passion in what he does, I can attest to this personally as I have heard him speak proudly of his clients when they progress and reach certain milestones in their fitness goals. At the end of the day, I place my trust on Shaun when it comes to being fit and healthy. I can say this because he’s been there supporting and teaching me through the entire journey. With his wealth of knowledge and ever-encouraging attitude, there’s no one else I look to other than him when it comes to leading a better and healthier life.